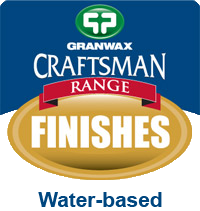 The water-based floor finishes range has been specifically developed by Granwax to contain very low, or zero, VOCs and solvents. 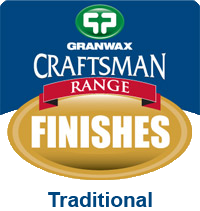 From the eco-friendly Nature, which has no VOCs and is perfect for those sensitive projects, to the extremely durable 2-component Masterfinish, which is gentle on the environment yet suitable for floors subjected to extremely heavy traffic, Granwax has an environmentally-friendly finish for every floor. 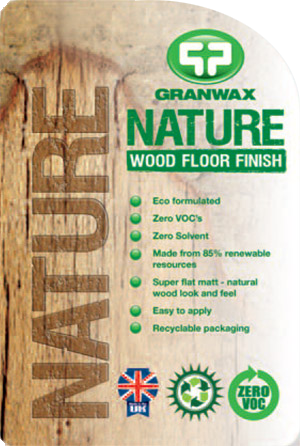 Nature is the latest eco-friendly wood floor finish added to the Granwax range of high quality seals and finishes. Gives super flat-matt appearance and adds the warmth, texture and colour enhancement normally associated with wax, oil and solvent based finishes. A unique blend of linseed oil based resins and is made from 85% renewable resources, with zero VOC's and zero solvents. 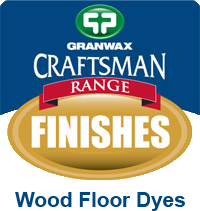 Masterfinish is a fast curing, 2-component water based polyurethane finish, designed for all wood floors subject to heavy wear. Ideal for use on wood block, strip and parquet flooring in all locations where maximum durability is required, such as schools, retail premises and sports floors. Very low VOC. Available in Silk, Matt, Ultramatt and Sport. Sport finish complies to BS7044 Part 4 (1991) under dry conditions. 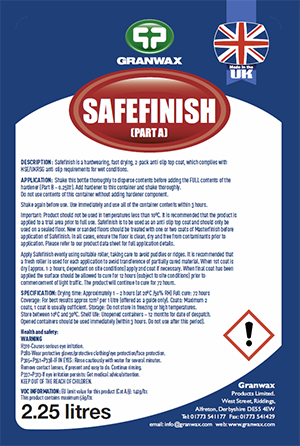 Safefinish is a fast curing 2-component water based polyurethane finish, designed as a top-coat for all interior wood floors, to help minimise the slip potential on floors which are particularly subjected to liquid ingress through foot traffic and spillages. The clear formulation will not significantly change the appearance or colour of the floor. 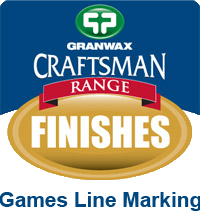 Provides a Matt finish (approximately 7% sheen level). Safefinish is ideal for use on wood strip, block, parquet and mosaic flooring in locations that are subjected to heavy wear and where maximum traction is of the utmost importance, such as public houses, bars and restaurants, public buildings and retail premises, stair treads, etc. 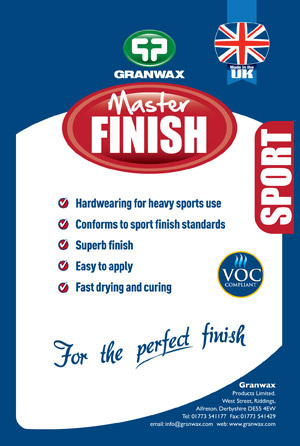 Safefinish cannot be used on floors which are used for sporting activities. 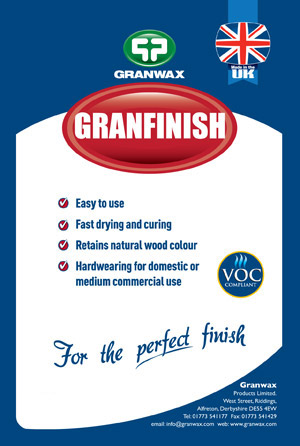 Granfinish has been specially formulated for use in retail, commercial and leisure premises, where maximum durability and minimum 'downtime' is essential. Fast curing, 100% cure after 16 hours, enabling floor access in a shorter time period than if a conventional finish has been used. Very low VOC. Available in Gloss, Silk and Satin finishes. 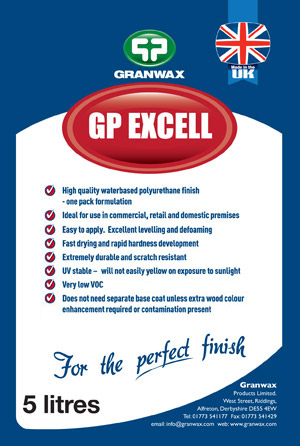 An extremely versatile polyurethane wood floor finish, ideal for use in commercial, retail and domestic premises, GP Excell has been designed for specifiers and professional contractors looking to achieve a blend of high performance and first class appearance. 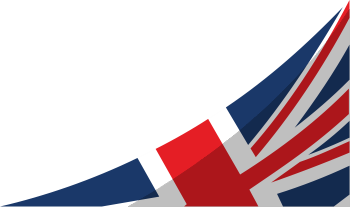 The advantages for contractors and end users include fast drying times, a choice of finishes (gloss, silk, satin, matt and ultra matt), low odours and very low VOC. 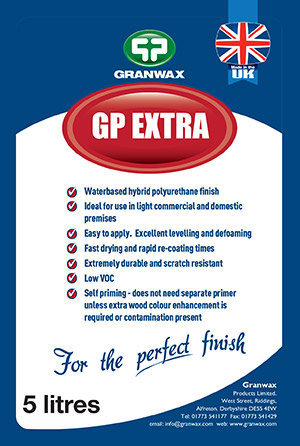 GP Extra is particularly suitable for cork and pine due to its flexible structure. It provides a fast drying, superb durable finish, which enhances and give durability to all types of timbers. Available in 4 sheen levels: Gloss, Silk, Satin and Matt. A fast drying base coat for new wood floors or refurbished wood flooring that has been sanded, prior to the application of the chosen Granwax water based finish. Ideal for use on strip, block and mosaic wood flooring that has no previous history of residual wax. Helps minimise grain raising and will enhance natural wood colour. A fast drying coloured base coat for new wood floors or wood flooring that has been sanded, prior to the application of the chosen Granwax water based finish. 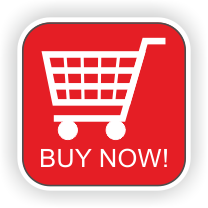 Ideal for use on strip, block and mosaic wood flooring that has no previous history of residual wax. Available in White, Grey and Black from stock. Other colours/shades are available upon request. We also offer a bespoke colour option. Please contact us for details.